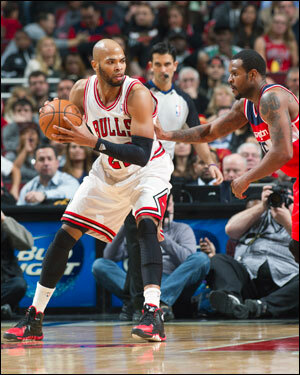 “It’s one play at a time and one game at a time,” said Bulls forward Taj Gibson. “We feel that we have the opportunity to do something special. We believe in the locker room and we believe in going far. But it comes down to one play at a time, really. Chicago and Washington met three times during the regular season. The Wizards won twice in January, while the Bulls recorded a blowout victory on the road earlier this month. Gibson said teams remember the last game they played, but they also tend to make adjustments for the next meeting, which is a key element in the postseason. That’s exactly why he likes having Thibodeau’s direction and focus on knowing the play calls, something the team drilled repeatedly during Friday’s practice. While the Bulls have home court advantage in the opening round, Thibodeau noted that playing well is necessary for that to be effective. And it won’t come easy against a Wizards team that finished with a 22-19 road record, tied with Miami and Toronto for the best mark in the conference. This marks the Bulls’ sixth straight postseason appearance. Additionally, 12 players on Chicago’s playoff roster have postseason experience. The Wizards, meanwhile, are returning to the postseason for the first time since the 2007-08. Two prominent members of their young but talented core, John Wall and Bradley Beal, have yet to play in the postseason. But Thibodeau discounted the notion that the difference in experience will give the Bulls a significant edge. As the regular season winded down, there was talk of how the Bulls were the team no one wanted to face in the playoffs. While Gibson says that’s nice to hear, it matters little come Sunday night. So the Bulls will control what they can control, and that starts with staying focused and remaining driven. Wizards guard John Wall is enjoying his best professional season, having averaged career-highs in points (19.3 ppg), assists (8.8 apg) and field goal percentage (.433). Kirk Hinrich was a teammate of Wall’s during his rookie season in 2010-11 and he saw back then that the draft’s first pick overall had the tools to be special. Joakim Noah missed Friday’s practice as he was in New York for bereavement. Thibodeau was hopeful that the All-Star center would rejoin the team for Saturday’s practice.